To what lengths will people go to protect their children? Spite their siblings? Murder the missus? Find out in twenty one digitally remastered and restored episodes, spanning two decades of radio's outstanding theater of thrills. 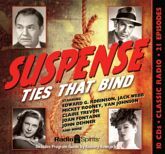 These sensational stories star Jack Webb, Mickey Rooney, Edward G. Robinson, Keenan Wynn, Van Johnson, John Dehner, Howard Duff, and more as members of fascinating families�with a rope around every neck and a knife in every back! We always hurt the ones we love.